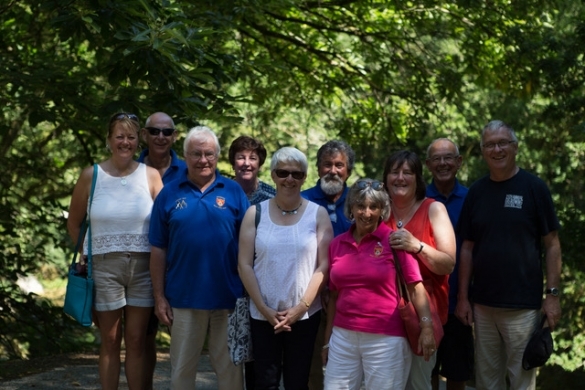 At the beginning of July, 120 choir members, family and friends embarked on the choir’s tour of Brittany. All those who went, agree that this was one of the best trips the choir has undertaken. Leaving Plymouth on the Wednesday night we arrived at Roscoff on Thursday morning and drove straight to Concarneau and within two hours had begun our tour with a ‘flashmob' in the square of the old town. 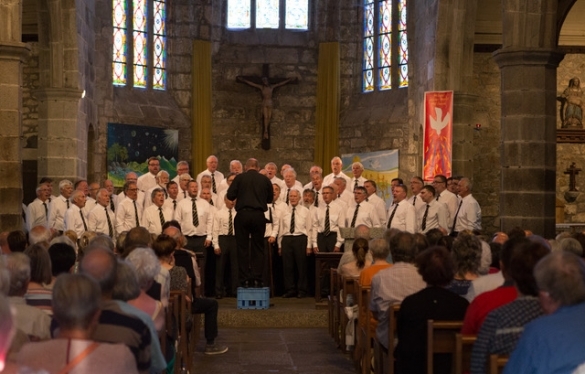 Our first concert was an early start of 4:00pm where we joined two local choirs, Mouez Bro Konk and Les Zingarelles at St Guenole’s church. The church was filled to capacity. Singing in 36C was a challenge but was quite breath taking with the Breton choirs performing A Capello. The sound which reverberated around the church was acoustically amazing. 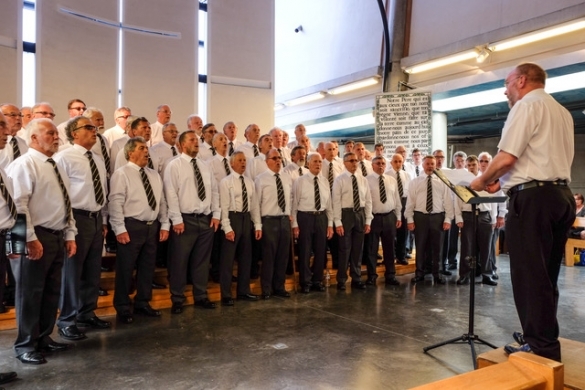 The concert ended with all the choirs singing the Cornish and Breton national anthems together which is set to the same music as the Welsh national anthem. All this was followed by an afterglow in the church hall, with food provided by our Breton hosts. This was a truly wonderful evening with the Cornish joining in with some Breton dancing. Thankfully there were no photographs of our efforts! Our base for the tour was in Quimper, the ancient capital of Cornouaille, Brittany’s most traditional region and this was where we returned to relax. 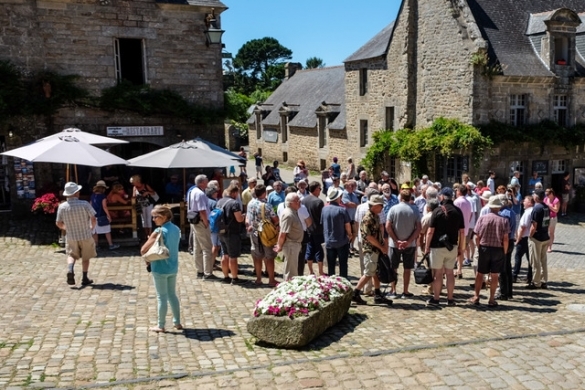 In the evening, quite a few members of the group were drawn to the grounds of Quimper cathedral to the sound of the Breton Bagad. Friday commenced with free time to visit Quimper. You could be forgiven in thinking you had returned to the Eighteenth century with the the buildings and streets reminiscent of that period. The ladies in the tour party were disappointed not to see Ross Poldark walking the streets!! Walking along the river Odet into the city was breathtaking with the the gardens and flowers adorning the city walls and river quite spectacular. In the afternoon our tour group made its way to Huelgoat for some more sightseeing and our second concert. Upon arrival, the town had arranged a reception to welcome us. Lost high in the Parc d’Armorique in central Finistère, the village of Huelgoat looks sleepy at first sight, and its lake peaceful. However, descend into the Argent Valley and you suddenly find yourself amidst a mass of magical mossy boulders that have stirred the Breton imagination in fabulous ways. After our evening meal, which we enjoyed together, the choir party made its way to the Eglise Saint-Yvres, the local parish church. Not sure what to expect, the choir walked in to find a capacity audience made up of locals and ex pats including Cousin Jacks. This concert was Mousehole’s own with Buccas Four and Maureen Nicholls playing a soloist role with her flute. For the first time on tour we received a standing ovation and were asked for an encore, which we were delighted to do. With the coach not picking the party up until midnight, the afterglow consisted of time spent with the locals who had provided wine and cake which was followed by a trip to the local pub, owned by a Cornishman from Falmouth where further singing ensued with orange juice! Our last full day in Brittany, again bright and exceedingly warm, gave us further free time in Quimper fro sight seeing and present buying followed by the first stop of the afternoon at Locronan which is a very impressive and unspoiled Breton village and certainly one of the most beautiful villages in Brittany and probably France. With a history that goes back more than 2000 years, Locronan was originally a sacred place for the Celts known as a ‘nemeton’ meaning a sacred space. It was here that we then undertook a second ‘flashmob’ to the joy of the tourists and locals. The church was busying itself for a wedding and after we had dispersed from singing, one of the choir members was approached and asked if we could sing at the wedding! Leaving Locronan we headed for our last venue of Dourarnenez. For the evening we were joined with the Mouez Port Rhu Shanty group in the church of the Sacred Heart. Another standing ovation again was followed by the singing of the Cornish national anthem 'Bro Goth agan Tasow' together with the Breton national anthem, 'Bro Gozh ma Zadou'. Singing continued at the afterglow in the local Stella Maris centre where a wonderful banquet had been provided by our hosts. Sunday morning brought with it packing and our trip home. We left the hotel having sang 'An Rosen Wyn’ as a thank you to the staff, which included a Cornish girl from Penzance, for having looked after us so well. Then it was the drive to Roscoff and homeward bound on the ‘Amorique’. With a captured audience, their was the final ubiquitous ‘flashmob’ in the bar (orange juice only!) singing our way home into Plymouth. It has long been considered that because of the shared heritage and, until the late seventeenth century, a common language between the Bretons and Cornish, that we are more brothers than cousins. This was very evident in the hospitality and camaraderie that was given to Mousehole Male Voice Choir by their respective Breton hosts. The tour had been a lot of hard work for the small group from within the choir who had organised it on our behalf to which we publicly say a very big thank you (You know who you are!). Also thanks go, again, to our musical team, Steve Lawry and Dave Williams making sure that we were at our best with the singing. The ladies of the Ladies committee also did the choir proud in selling 43 CDs of our latest album ‘Home From The Sea’ in Brittany. Last, but not least the choir want to say a very big thank you to Dave Ceredig-Evans, second Tenor, who stepped in at the very last minute to become our accompanist due to sickness.